It’s not difficult to imagine a different cut of Anna Rose Holmer’s The Fits that hews closer to the arc of a traditional sports story. Hers has the makings of a familiar one, of a misfit who wants more than anything to compete—but unlike most stories of inspirational audacity, The Fits is as much about discomfort as the catharsis that comes with achievement. Coming from a physical background where she throws her entire body into each movement, Toni’s made aware that dancing requires an entirely different level of finesse. With her limbs akimbo, she lags behind her new teammates, struggling to keep rhythm. Hightower fully embodies this discomfort through her spindly body movements, noncommittal eye contact and hesitant vocal patterns—she opens her mouth with the seeming implication that she’s going to be immediately shut down. There’s a tremendous alchemy between Holmer’s direction and Hightower’s performance, as the film integrates gender commentary through both character moments and sharp, unspoken contrasts. Spending equal time in the gym and the dancing studio, Toni is able to fluidly move back and forth between male and female spheres of expectation, but she still faces both groups as an outsider. She’s not afraid to jab at Jermaine and the other boxers in front of the girls, but she’s also still too self-conscious to change with the other girls, slinking off to a bathroom stall. The difficulties of conforming are further complicated by the introduction of “the fits,” a nearly supernatural series of convulsions that plague random individuals at the recreation center. Cinematographer Paul Yee and Holmer first shoot these episodes through a wall of camera phones, but gradually they’re treated with a mounting formal elegance until a nearly transcendent climax. These paroxysms are a visual representation of the fears of the limits of achievement, but also a canny comment on shared experience as those who experience “the fits,” and those who don’t, separate into their own clans. Amplifying the formal clamminess, Holmer centers the narrative entirely at the Lincoln Recreation Center, creating a sense of both a tight-knit community, and a gnawing claustrophobia. The outside world is rarely acknowledged, aside from a rare shot of news footage as “the fits” become news and a late sequence where outsiders arrive to attend to the sick. Framed with a rigid sense of space by cinematographer Yee, and backed by the groaning score from veteran composers Danny Bensi and Saunder Jurriaans , The Fits is infused with such dread that it’s not hard to imagine that characters’ muscles and bones could break or shatter at any moment. The film’s most explicit example of may be Toni pulling off a temporary tattoo, but The Fits is firmly a story of metaphysical body horror, an allegory about our greatest fears of physical fragility. 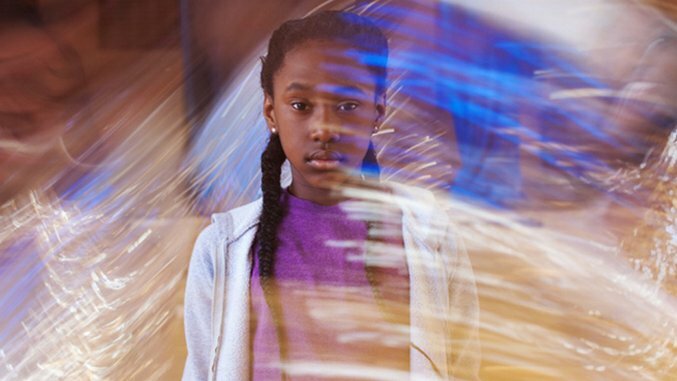 At barely an hour and fifteen minutes, The Fits can occasionally feel like a short film bumped up to feature length, even as it moves so confidently through its moody story. Especially near the end of its second act, when the film starts introducing a number of new characters—including a group of perky friends—The Fits starts to seem unusually rushed after the relatively meditative pace of its first half. Yet, even in an abbreviated running time, The Fits manages to reinvent the sports story as something both brainy and physically pure.